Congratulations Lucas for all your hard work this year. The Scott Amos Award is given each year to a special member who is recognized as being our Rotaractor of the Year. 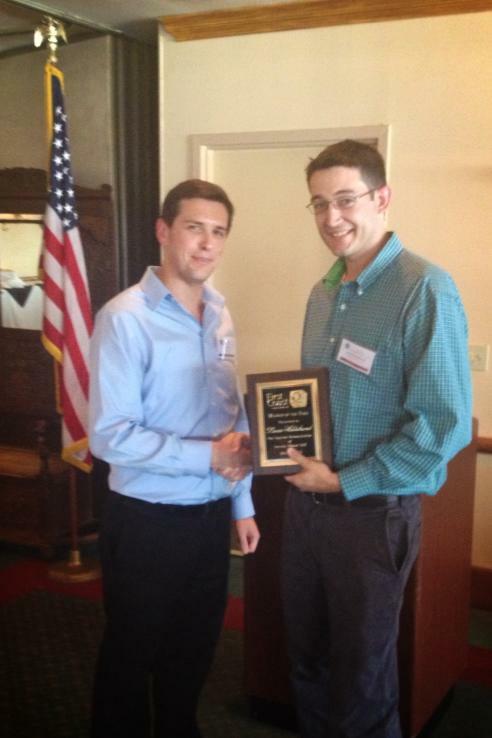 Lucas Hildebrand was elected Rotaractor of the Year for 2012-2013. Lucas was our community service chair this year and responsible for planning our monthly volunteer activities. He not only planned, coordinated and executed each of our service events – he did it with a smile. Additionally, mid year, our elected 2012-2013 treasurer was offered an exciting position elsewhere and moved from Jacksonville. Lucas stepped up and assumed that role as well. He has truly been an asset to our club and we wanted to acknowledge all the tireless work he has done on behalf of First Coast Rotaract and the larger Jacksonville Community. This entry was posted in Jacksonville, Jacksonville Rotaract, Membership, News, Photos and tagged Jacksonville, Jacksonville Rotaract. Bookmark the permalink.